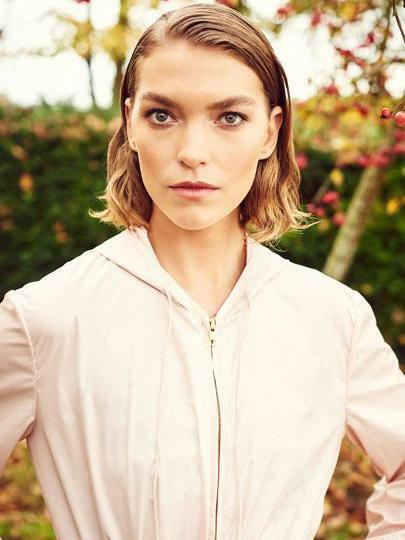 A designer best known for evening dresses and bridalwear, Emilia Wickstead is casting off her feminine virtues in favour of athletic garb. This year, the London Fashion Week favourite has collaborated with Bodyism – a high-end health and fitness brand – to create a 13-piece range of activewear that includes leggings, sports bras, jackets, hoodies, jumpers, jumpsuits and even a yoga mat. And while Bodyism founder James Duigan tackled the technical side of things, the style is where Wickstead’s name as a designer really comes into play. Aside from being functional, the collection gives sporty pieces a feminine edge, with her trademark florals and a colour scheme of dusty pink and royal blue. What’s more, each and every piece is inspired by and named after an A-list friend of the brand, such as Sienna Miller, Karolina Kurkova and Liv Tyler, while American fashion model Arizona Muse fronts the campaign. “Fun and exciting yet unexpected, this collection is inspired by the strong feminine personalities that embody the Emilia Wickstead and Bodyism brands,” the designer said. The entire range is available from 12 March at Bodyism.com and a number of retailers such as Net-a-Porter, Selfridges and Harrods.